1. Nope. That ain’t right. 2. Really, really not how it’s done. So after not passing Go, not collecting $200, and going straight to jail for that monstrosity, I was shown by some dear friends how it’s actually done. It was bliss. The real hero of this dish is the sauce, which is made with a myriad of peppers, onions, and lots of patience. At first I questioned the home-frying of the tortilla chips (because yea, I can be lazy sometimes. I’m American.) but that was a huge mistake– home fry. Do it. Do it now. 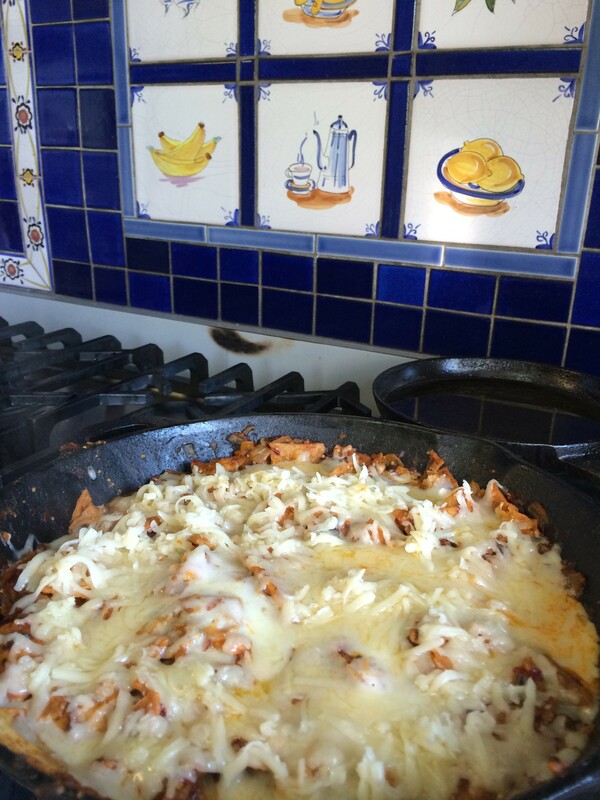 Chilaquiles needs no eggs, no beans, no elaborate fan fare. 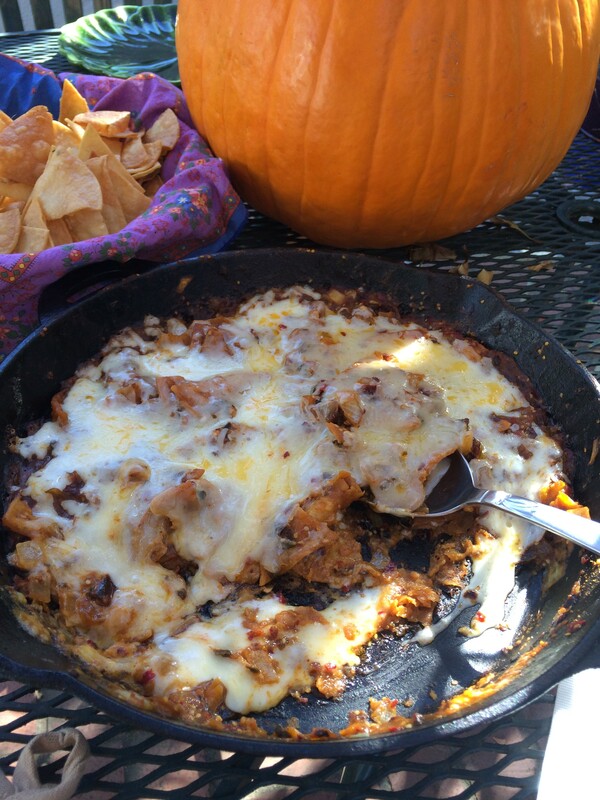 It stands on it’s own and the following is the only recipe you’ll ever need. Thank you, Tyna and Lowell, for showing me the WAY. The following will feed about 5-6 people and takes about 2 hours to prepare. Heat the oils over medium heat until hot (test with a single chip— when bubbly, it’s ready to go). 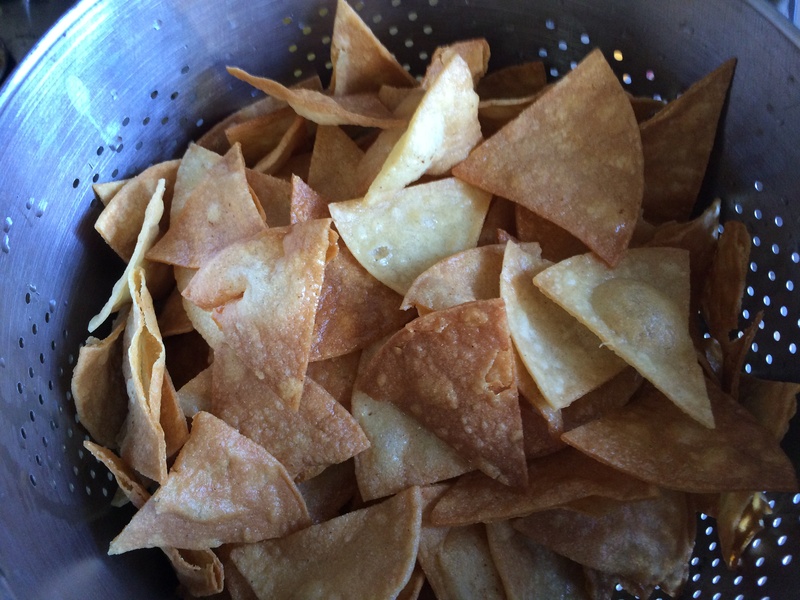 Working in small batches (don’t overcrowd the chips), fry the chips until golden brown on each side. Some may be crispier, some may be chewier– this all adds to the beauty of the finale. Meanwhile, saute the diced onions until soft and brown. It is recommended to do this in two pans, because quite a bit gets added to the pan over the course of the recipe). Remove ALL seeds from ALL peppers by halving them with a knife and scrapping them out with your fingers or a knife. 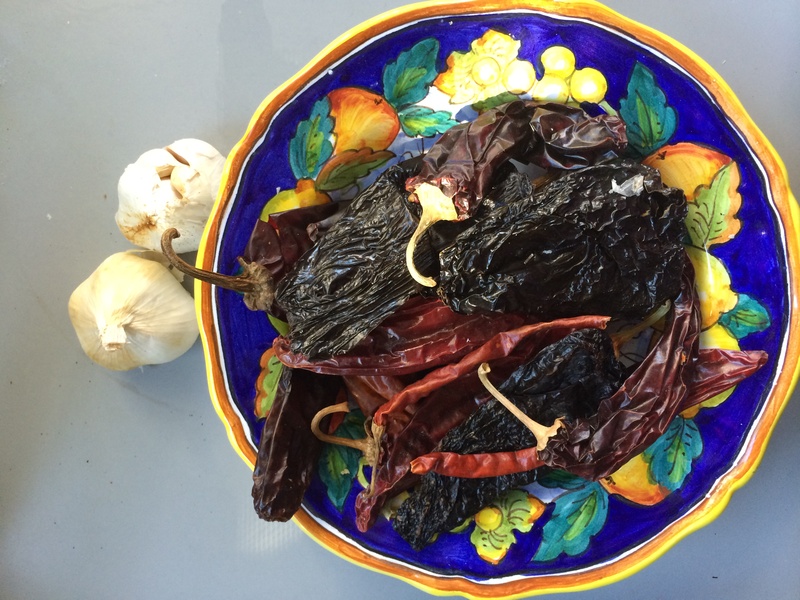 Place peppers, garlic, cumin, and tomatillos in a blender and puree until smooth. Add to pan with sauteed onions (divide between the two pans) and cook for 1o minutes, simmering. After ten minutes, add a generous handful of chips to each pan and cover with sauce. Let them soften a bit and cook in the sauce before adding another handful. This process can take 20-30 minutes, so be patient. You may not be able to fit all of the chips in when things are said and done– that’s ok. Eat them on their own! Once you have a pan full of sauce and chips, sprinkle with cheese and let cook until melted (About 5 minutes). Remove from heat and serve. Tofu is one of the most unsexy foods to behold on this earth. It’s a wet, taupe-colored block of soy and it’s no wonder many people take one look and say “Thanks, but I’d rather lick my own foot.” But it is deliciously adaptable, weirdly addictive, and, well, just plain fantastic. 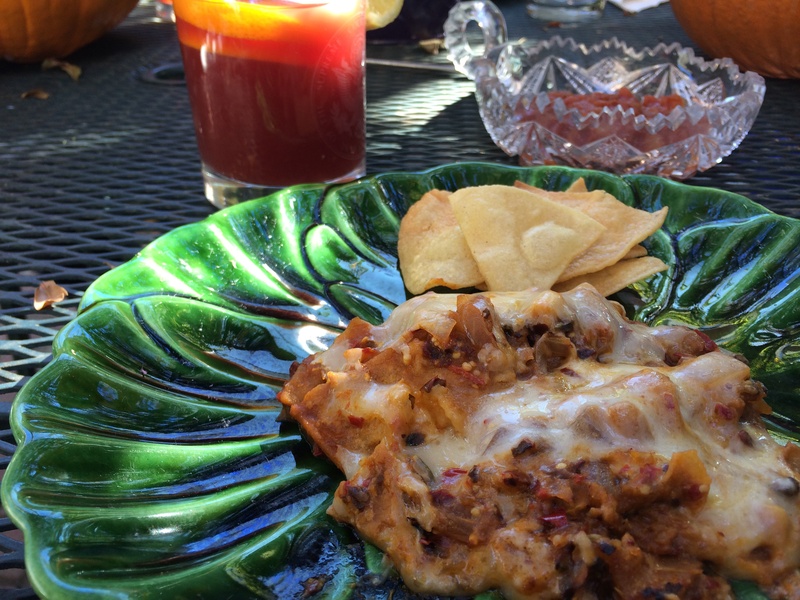 After you get over the initial weirdness of it all, it’s hard not to become a tofoodie. Tofudie. Tofudite? Whatever we call ourselves, tofu lovers are always finding new ways to embrace the king of soy. 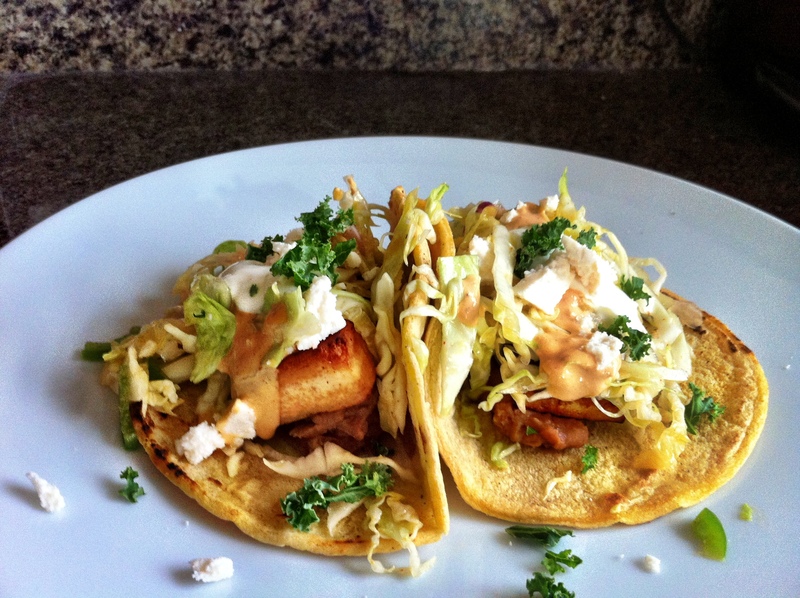 Cholita Linda got me hooked on their spicy tofu tacos and I wanted to recreate it on my own. 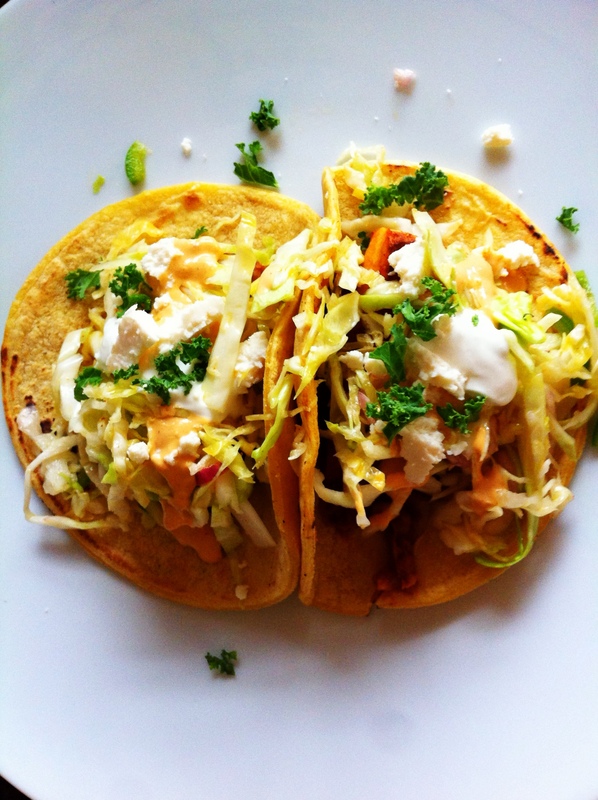 In my world, the best tacos have a lot of different toppings and components. It makes them a bit complex, grocery-list wise, but completely worth it in the end (ie, don’t be scared off by the ingredient list below!). And the best part is that everyone gets to pick exactly what they want to craft their dinner time masterpiece. I’m a saucy gal and wanted lots of it to top the crunchy slaw and crispy tofu, so I made crema and chipotle garlic sauce. Tangy, spicy, and extremely messy, I was very pleased with how it all came together. 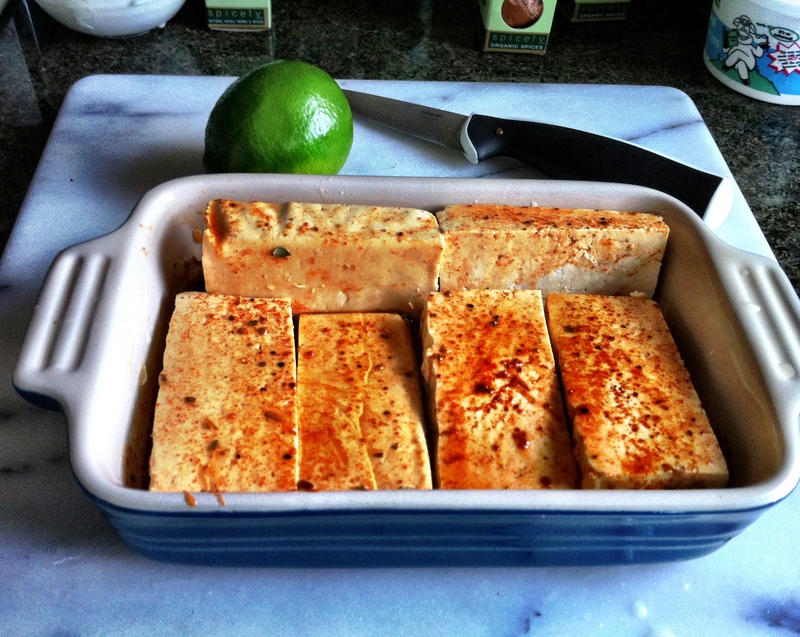 Prep the tofu by pressing it in-between paper towels, until some of the moisture is removed. 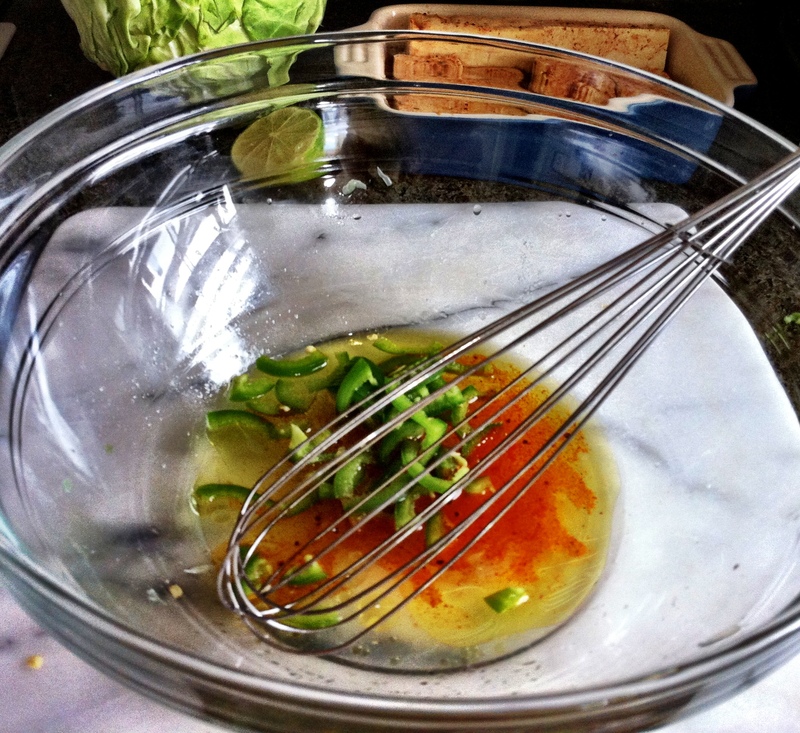 In a rectangular dish, whisk together the marinade ingredients. Lay the tofu pieces flat and marinade for 20-30 minutes, turning occasionally. You can also marinade it overnight. Meanwhile, make the crema by whisking together the sour cream, lime juice, and salt. Set aside. With an immersion blender, in a Cuisinart, or in a regular blender, puree all the chipotle ingredients until smooth. Salt to taste. *Note: the chipotle peppers are spicy. 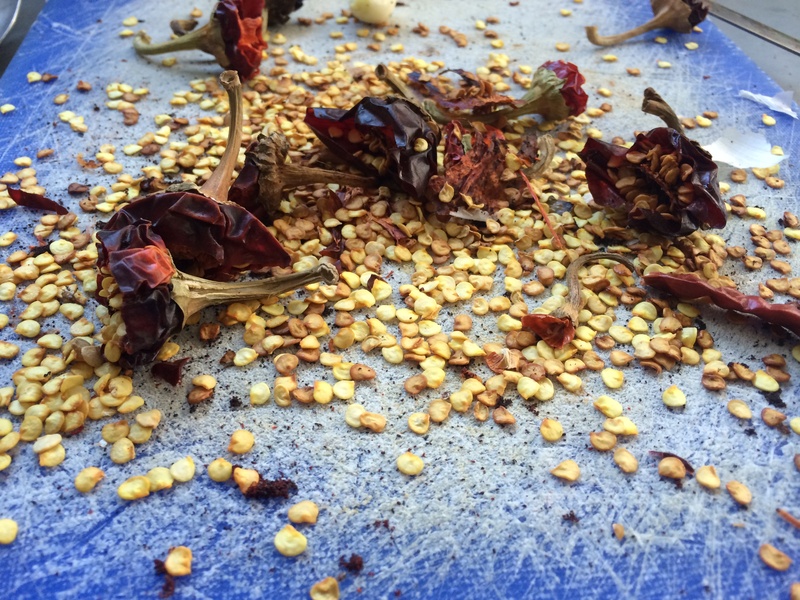 If you are sensitive to spice, start with half a pepper and work your way up. 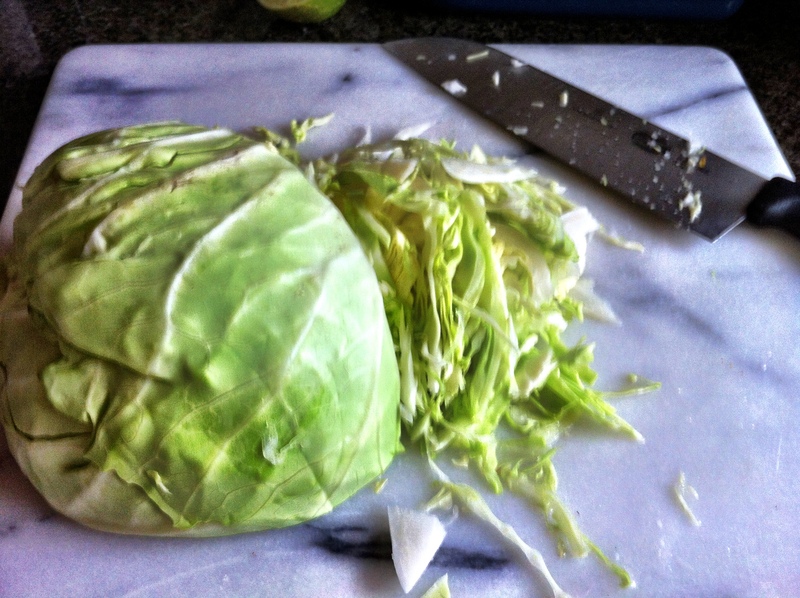 Make the slaw by very finely slicing the cabbage, so that it is very delicate and thin. 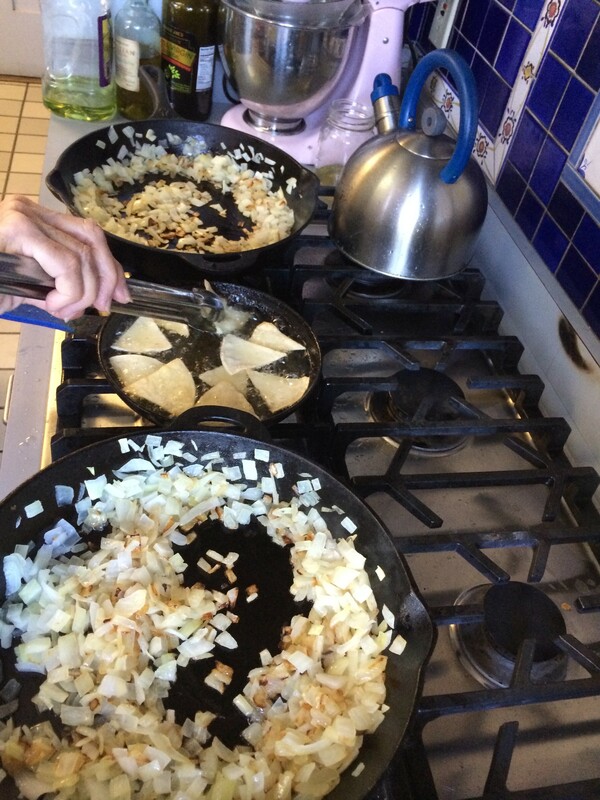 Whisk together the rest of the ingredients in a large bowl, then toss in the cabbage. Place a medium saucepan over medium-high heat and remove the tofu from the marinade, patting dry. Add the oil to the pan and, when shimmering, lay the tofu down. Cook until brown and crispy, about 5-7 minutes per side. 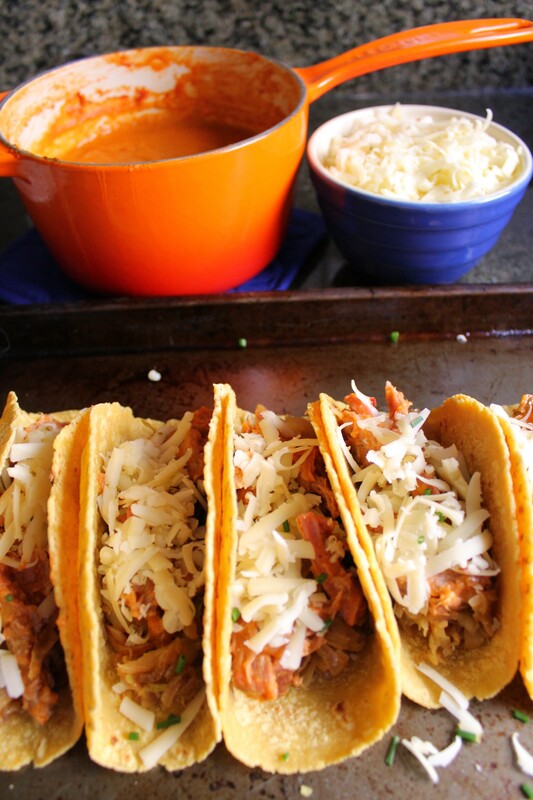 Assemble tacos by layering beans, tofu, slaw, sauces, and cheese on top. Enjoy!